It is always useful to have some creative projects ready to go at any time of the year and this post is JAM-PACKED with ideas. 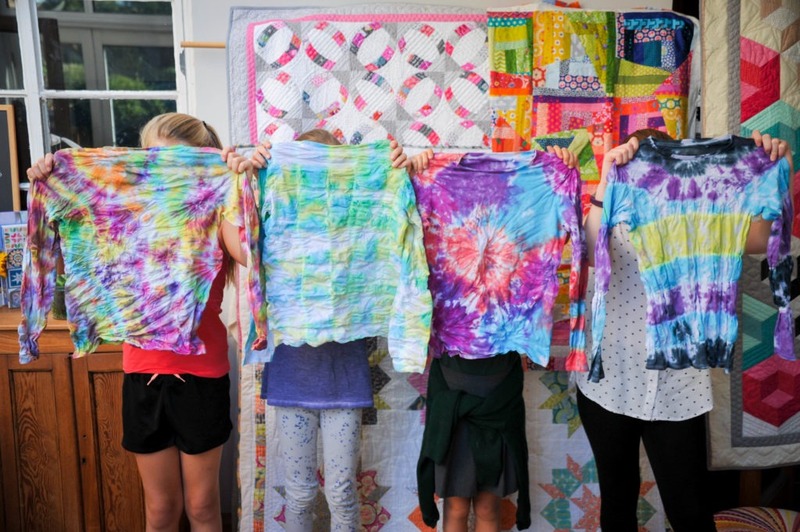 These are my top 5 go-to projects for children aged 12-16 years of age. They take a morning or an afternoon to complete and will keep the student engaged in the creativity for all that time and longer. All these projects use easy to find and cheap resources – creativity doesn’t need to be expensive and often finding all the stuff to use can be just as fun as making the item. If you need a reminder on how to set up your sewing machine? Click here for my latest video on getting you started. These are fun and cheap to make!! Once you have made one, you will be hooked. 10-15m of cotton rope (uncoated washing line is perfect – or 6mm piping cord), you will need to get your machine needle through it – so avoid solid plastic cores. Jeans or Leather Sewing machine needle (a size 90 would be great) – These are easy to buy from a fabulous British shop John James. 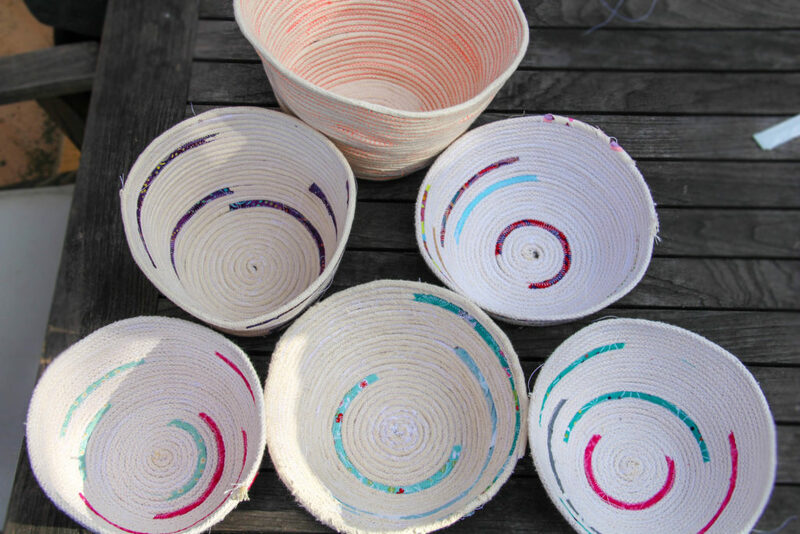 Watch me demonstrate how to make a rope bowl here. Gather together scraps of fabric, two pieces of wadding (or an old tea towel) and a zip. This is such a popular project that I have written a tutorial for it which is attached below. 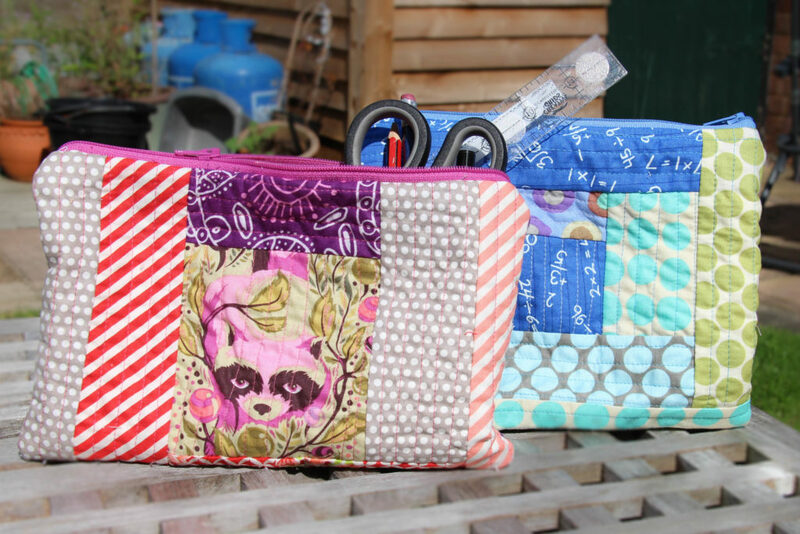 This easy project has gripped my sewing classes for weeks. They have made them for themselves, for family members and wrapped them up as gifts. Absorbent natural material. I have used bamboo Terry Towelling fabric, but microfibre cloths from the pound shop would work just as well. See what you can find. Good ideas don’t need to be expensive! Wadding or an old tea towel to give the wipe structure. 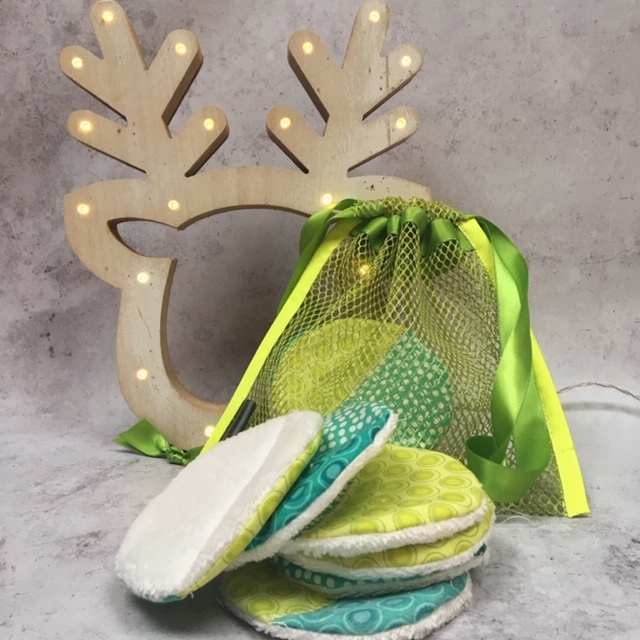 For each circular wipe you will need a circle of absorbent material, a circle of wadding/tea-towel and two circles of fabric. Now watch this video here to see how easy it is to make these great items. These are really useful, versatile bags to make. You can fill them with toiletries, sweets or presents. You could even get ahead of the game for family birthdays or Mothers Day. They can also be scaled to any size. Below is my cheat sheet on making these bags. I hope you enjoy making them! 100% cotton items to dye. 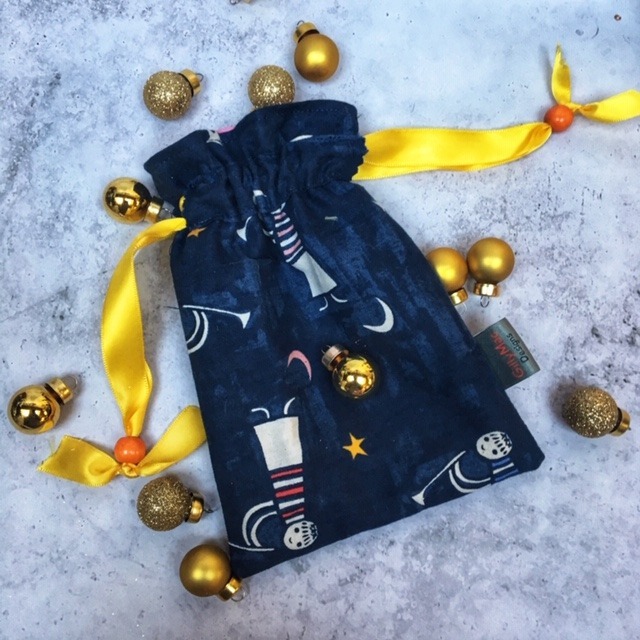 T-shirts, tea towels, camisole tops, or plain fabric you can make into a scarf or bandana later on. Soak the items in warm water and squeeze the water out as much as possible. Next put as many elastic bands on your item, and wind them as tightly as possible. The more bands you can get onto your item then better. Even when you think you are done – add more!! Once all the bands are on, pop it in the washing machine with the dye, following the manufacturer’s instructions). When the washing machine is finished, take the item out and remove the bands and give it a good shake … Hey presto – a fabulous tie dye item. You can repeat the process using a second dye of a different colour the same item and this will produce some great blended patterns and shades. 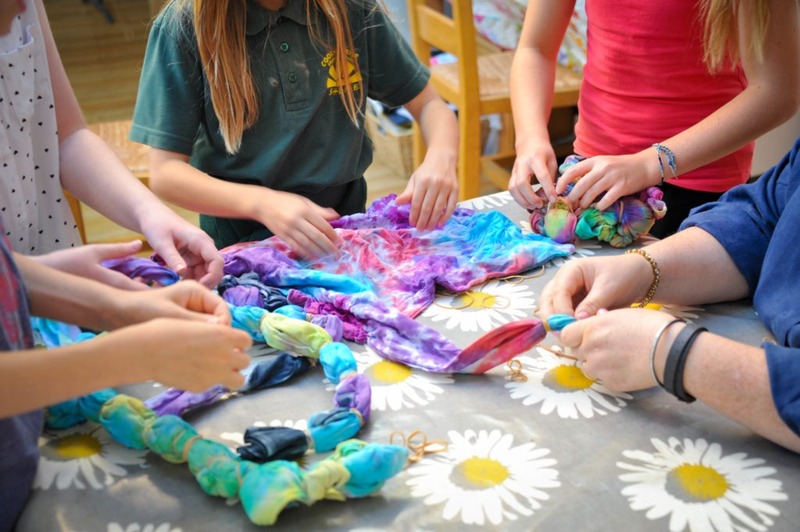 For more ideas about tie-dye and the shapes you can make, have a look at my Pinterest Board here. I hope you have enjoyed this tutorial. To keep up to date with all the other projects and tutorials I release, please like and follow my Facebook and Instagram pages. This is a simple way to package any note or card which is quick to make and looks fabulous. In my teen Christmas classes last week we were making a version of these envelopes and filling them with chocolate coins as extra family gifts, however at this time of year, when we so many Thank You cards are being written, I thought these would provide a perfect envelope for my own Thank Yous this year. Kam Snaps, hook closure or button and loop. Cut around the outline and press the bumpy/gluey side of the bondaweb template to your piece of felt using a hot dry iron. With your frixon pen draw around the part of the envelop that will be the front. This allows you to see the size of the area that you have to work on for your message. Optional Step : Create a panel for the front of your envelope. My panel was 2″ x 3″ and backed with bondaweb, but can decide the right size for your envelope. I cut this edges of the panel with pinking shears to create more interest. The benefit of adding this panel is that the change in colour adds contrast to your envelope front and it also means that if your free motion writing goes wrong (:-)) you can start again without having to recreate the whole envelope. Write your message on the front of your envelope or on your panel with a dark thread using the sewing machine fixed with a darning foot. I find it helpful to draw out the message I want to sew with either pencil or friction pen and then trace over it with the sewing machine. On felt I find a friction pen is fine to use, but check on a small area if you are unsure. Once the message is finished, remove any remaining frixion pen marks and if you have created the optional panel, fix it to the front of your envelope and free motion sew around the panel to complete the look. Remove the bondaweb from the back of the felt envelope and iron the lining fabric to the exposed glue on the back of the felt envelope. Once the lining is attached, trim the lining back with scissors so it is flush with the felt. Using a blanket or other decorative stitch and a normal/zig-zag foot on your sewing machine, sew around the edge of the envelope from the felt side. Fold the edges of the envelope up and press it with a hot dry iron and pressing cloth. The envelope is now complete except the fixings. I used a kam snap, but a hood and eye or button and loop could also be used. With a frixion pen, mark where the fixing need to be on both parts of the envelope and fix the closures. 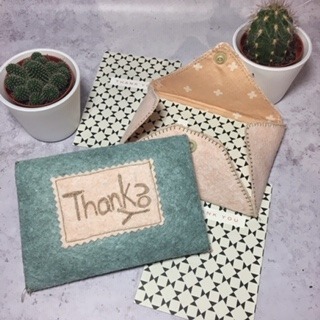 Add your park inside and you have the perfect thank you gift ! 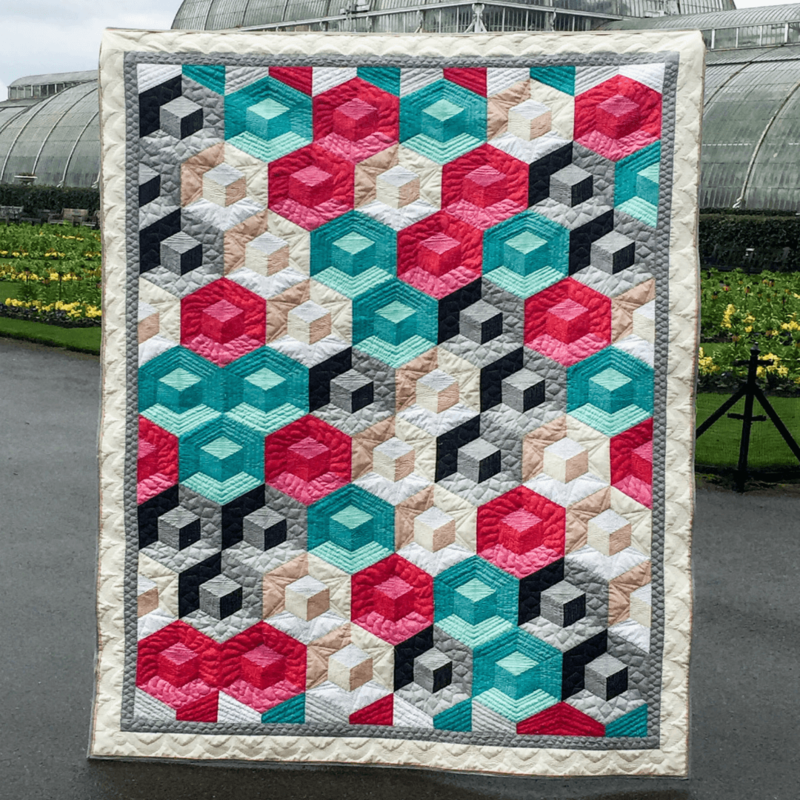 It’s here ….below you will find my Magic Squares Quilt Pattern. It was always my intention when I wrote this pattern that I would offer it for free. The topic of free patterns came up when I met a fellow designer last month. She fully believes that the sewing pattern market is devalued by patterns being offered for free, whereas I believe that offering some patterns for a short time for free is a good thing to encourage people to try something new. So here it is. It is available until Christmas and will then be removed. If I could ask you to do one thing …. if you download the pattern, then please sign up for my newsletters via the contact page on this website, and instead of sharing the pattern, please share this page and ask your friends to download it and also sign up for the newsletters.